Patrick and Doug do the truffle shuffle, fight off an octopus (or do they?) and take a ride up Troy's bucket while following One-Eyed Willy's rich stuff map towards this f'ing of the beloved 1985 adventure movie The Goonies. Because down here it's our time. Our time. Haunted River. And that was the best ride ever!!! - I think for my generation growing up in the early 90's, the movies which offered this same sort of magic were the Disney animations of the time. Personally, my movie was always Top Gun though. It came out before I was born but the VHS found its way into my house probably because my uncle was a naval aviator, and I loved the planes and stuff. Only later did I learn to appreciate the romance and drama, although to be fair that's another movie like the Goonies which isn't the masterpiece 10-year-old me thought it was. - There are movies from my childhood which I now recognize are bad and which are actually difficult to sit through. Lots of Adam Sandler stuff. I love Doug and you guys get along really well together but wow do you get off topic easily. Wait no, that's too sour a note to end on. You guys are great! Very funny stuff! 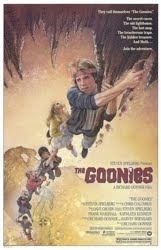 Happy Birthday, Goonies! Still one of my favorites ever.